We have 17 years of experience in compact skid steering loader manufacturing. 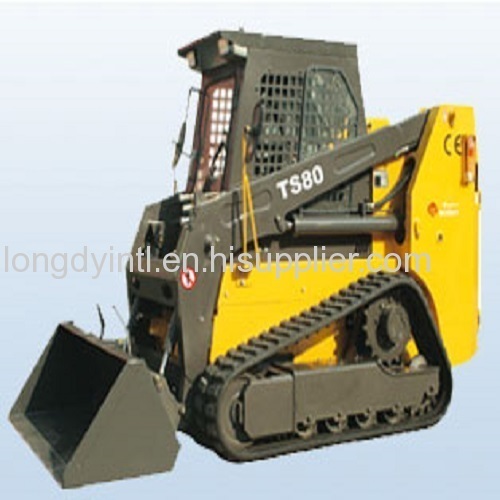 We were the first manufacturers of skid steer loaders in mainland China. Now we have developed into a full-blown manufacturing and exporting business with over 18 different types of skid steer loaders available. We also offer wheel and track loaders, hydraulic products, pumps and other machinery. Our products have been exported to about 40 countries or regions covering European Union,Western Africa, Australia, South East Asia, Middle Asia and North America. As a leader in skid steer loaders in China, our products have gained high reputation from customers. We have maintained CE certificate, Russian Gost certificate, Chinese government ICQ certificate and ISO9001 certificate.Some of our parts are sourced from the US, England, Italy and Japan for added quality and reliability. We are confident in our products and we offer a one-year warranty for each one. We have 7 production lines and 260 employees.This allows us to create 200 machines each month, with the range of 40 —120hp, and engines of Perkins, Cummins, Hyundai, or Deutz for option. We provide optional chain transmission or gear transmission, mechanical control type or Joystick control type, open FOPS cab or enclosed FOPS cab, handle brake, hydraulic brake or electric brake, wheeled or multi-terrain tracked type, with or without A/C, with or without 2-speed transmission system, optional high-flow system, special narrower width or lower height loader, mechanical leveling or hydraulic auto-leveling as well. Furthermore, more than 20 types jobmatched attachments meet your different demands. The emission standard reach EPA Tier3, and Tier4 is optional.